Holiday Food Background For Baking Gingerbread Cookies. Vintage Paper Sheet For Christmas Recipe. Text Space, Top View. Photo title: Holiday food background for baking gingerbread cookies. Vintage paper sheet for christmas recipe. Text space, top view. 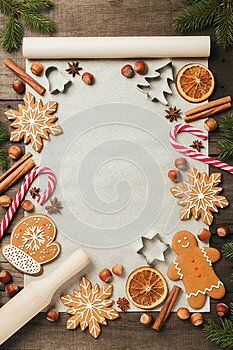 Holiday food background for baking gingerbread cookies. Vintage paper sheet for christmas recipe. Top view with space for your text.